Don’t look now, but the Colorado State Rams men’s basketball team leads the Mountain West conference. OK, Ram fans, look right now as this doesn’t happen too often. 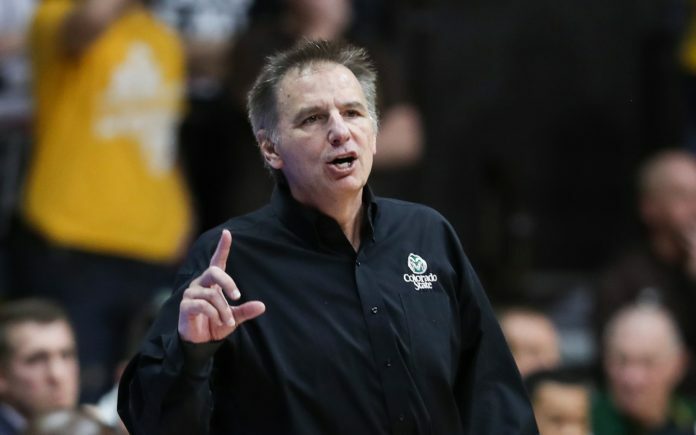 In fact, this is only the second time Colorado State has led the conference in the five seasons since Larry Eustachy took over the team in 2012; and that was a tie with New Mexico, nearly four years ago to the day. For 10 days (Feb. 6-16), the No. 24 Rams were tied with New Mexico for the MW lead, meaning this is the first time CSU has been in sole possession of the conference’s top spot during the Eustachy era which has seen two NCAA Tournament appearances and more than 100 victories. In the wild Mountain West, anything can happen, and this year, the parody amongst the 11-team conference is clear. Normal powerhouses San Diego State and UNLV are struggling through down seasons while New Mexico is only so-so: That helped open the door the Rams to run to the top spot. Still, what the green and gold have managed to do this year — especially since conference play tipped off — has been nothing short of extraordinary. The “Magnificent 7” is magical. CSU has won 7 of 8 games, their 10-4 conference start is the best since joining the Mountain West, which includes four straight road victories. Is this team any good? 10-4, yeah buddy. 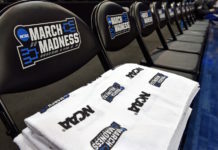 The magnificence of it all is this: With only 10 active players on the team, Colorado State started the season with a short bench, which was cut to a mere seven when three players were declared ineligible to play in the spring semester. The “Magnificent 7,” led by the dynamic duo of Gian Clavell and Emmanuel Omogbo, have bonded together like no other Eustachy-led Rams team we’ve seen. Clavell is the flashy, fun, fantastic baller who can take a player off the dribble or pull up from 35 feet to sink one from beyond the arc. His athleticism is sensational, and if he didn’t miss the first nine games of the season due to a suspension, Clavell would be in the running for Mountain West Player of the Year. Meanwhile, Omogbo is the grind-it-out workhorse of the team, a double-double machine who just recorded his 15th such statistical honor in Laramie, Tuesday night. Omogbo’s 10.8 rebounds per game are easily the most in the conference; he’s been a beast, a lion in the painted area ready to pounce on his prey. Omogbo, with his unthinkable family tragedy which took place little over a year ago, is the heart and soul of this Rams team, too. The other six players not only want to win for themselves, but they want to win for E.
The Rams rallied around Omogbo last season, which ended in mediocrity and disappointment. This year, the group became even more bonded when they lost a physical game to New Mexico at Moby Arena which included extra-curriculars with Omogbo and Lobos’ assistant coach Terrance Rencher getting into a shouting match which almost turned physical. Since that game, which was the first contest the Rams competed with only seven players, Colorado State is 7-2, and squarely in position to win the Mountain West. Of course, their final four games are no cakewalk. CSU takes on New Mexico in “The Pit” next Tuesday, then the Rams host SDSU and Wyoming before flying to Nevada to play the 19-6 Wolfpack to end the regular season. But, this Colorado State team is something special, proving on a game-by-game basis they’re legitimate. It’s not just Clavell and Omogbo who have stepped up their individual games. Prentiss Nixon has taken the leap from backup guard to true starting point guard who can also score the rock. Nixon’s offensive improvements are most notable, but what can be missed is his infectious effort on the defensive end and his ability to draw a charge in nearly every game. Nico Carvacho, the redshirt freshman forward, gives the Rams a true big man who’s been coming into his own this season. Carvacho’s realizing he can bully opposing forwards for rebounds and his chemistry with Nixon has grown, as evidenced by the back-door dunk against San Jose State. Having only seven players has bolstered the growth of players like J.D. 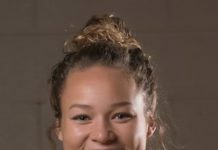 Paige — who’s scored 17 or more points five times this year — Anthony Bonner and Braden Koelliker, too. Here’s the thing: While this team has banded together like a group of outlaws against the world, winning the Mountain West in the regular season will be no more than a point of pride. It would be a positive, sure, but it won’t get Eustachy and his Rams into the NCAA Tournament. They’ll have to win the Mountain West Tournament — three games in three days — to earn a bid into the Big Dance, as will any team from the league in this parody-filled season. Can Colorado State do just that? They’ve already exceeded expectations by far, so, why not? Of course, playing with only seven players has both its advantages — like an increase in chemistry — and its disadvantages — like extreme fatigue. Larry Eustachy admitted last week he can’t practice his team because he’s afraid one of them will be injured or he’ll wear the players out, while Clavell has said all season long the players are built to play big minutes due to the amount of running they’re subjected to in preseason practices. With seven games to go, they hope, the Rams must again rally and push through the end of the regular season and MW Tourney to make the NCAA. It would be a storybook ending to a special season which has seen the team come together like we’ve never seen under Eustachy.